Model predictive control (MPC) is a modern optimization based control strategy, which has been predominantly used for applications with slow dynamics so far. The implementation of MPC for fast systems such as active vibration attenuation (AVC) requires a firm theoretical knowledge of the method, its issues and limitations. This chapter is aimed at the reader with little or no prior contact with model predictive control. Discussing basic concepts like prediction, penalty, cost and optimization helps the reader to get up to speed using the most straightforward approach possible. Taking the basic building blocks of MPC and assembling them, one should ultimately understand how the optimal, constrained, quadratic programming-based MPC algorithm works. 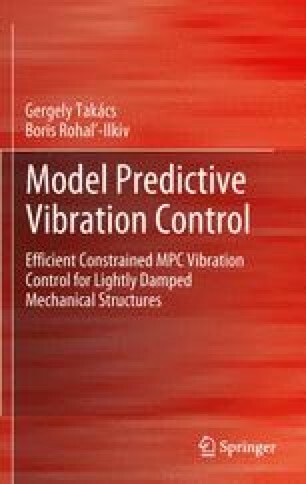 The chapter starts with an introduction of the fundamental idea behind model predictive control, followed by a review of the historic development of this field of control engineering. Next, generating a sequence of future states based on the current measurement and a state-space model is presented. Assembling a numerical indicator of the quality of control from the grounds up is just as important as predicting the sequence of future states, thus essentials of creating a quadratic cost are also presented. With the cost function available, one is able to create a simple MPC control law in the absence of constraints. Finally, the formulation of process constraints is described, and the resulting quadratic programming (QP) optimization problem is reviewed. The mathematical problem of quadratic programming is presented through an example, along with two basic solution algorithms for QP. The chapter is finished by the discussion of the important infinite horizon cost dual-mode MPC algorithm.